What to do with a pineapple that is too tart? 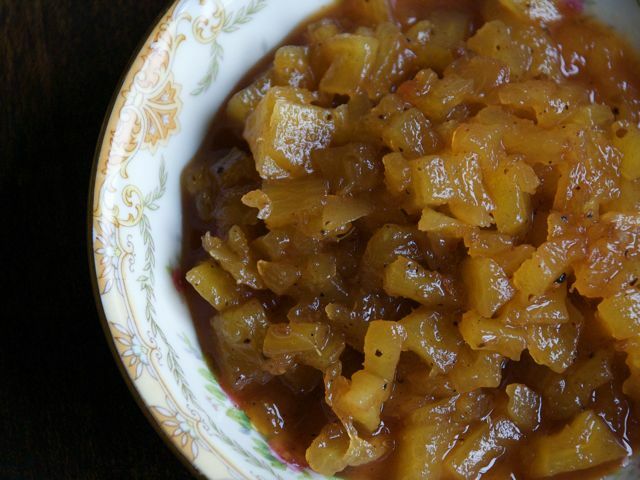 Turn it into this absolutely ravishing chutney for a Christmas gift. Peel and core the pineapple. Put the pineapple into the bowl of a food processor and process until coarsely puréed (or chop the pulp finely, using a sharp knife). Put the puréed pineapple along with all the other ingredients in a medium-size enamel pan over medium heat. Heat the mixture, stirring often, until the sugar completely dissolves, and bring to a boil. Cook, uncovered, over low heat until the contents of the pan look thick and glazed like jam (about 30 minutes). Turn off the heat, pour into sterilized jars, and seal. Although it is ready to serve, the flavor improves with two or three days of resting at room temperature. Keeps indefinitely until opened, when it needs to be refrigerated.